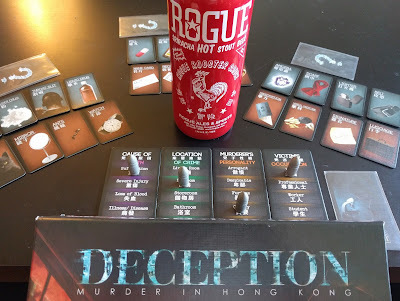 Deception: Murder in Hong Kong is an excellent party game for 4-12 players, which only takes 20 minutes or so to play and involves hidden roles, which are my favorite. In the game, players take on the roles of investigators attempting to solve a murder case, but the twist is that the killer is one of the investigators! 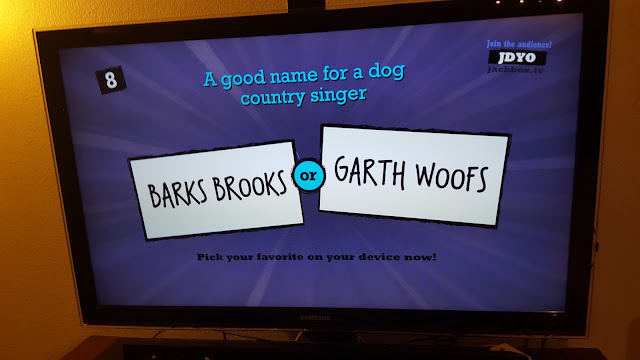 Each player's role is randomly assigned at the start of play, and one person is randomly assigned the Murderer. While the Investigators attempt to deduce the truth, the murderer must deceive and mislead. The Forensic Scientist has the solution but cannot speak and can only express clues using special scene tiles, which the investigators (and the murderer) attempt to interpret the evidence. In order to succeed, the investigators must not only deduce the truth from the clues given, but also see through the misdirection being injected by the Murderer. To me, this resembles a blend of the game Mysterium (with silent clue giving) and The Resistance (hidden roles & deduction). 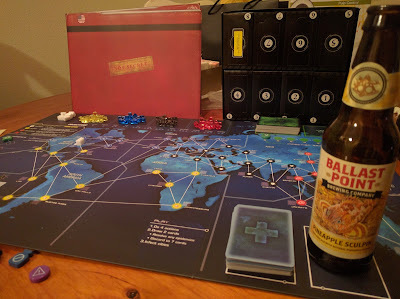 Thus if you like either of those games, you will likely enjoy this one, and I recommend it. While we were solving murders, we indulged in Rogue Brewery beers from Oregon, which has a ton of great beers on tap with brewpubs all other Oregon and even one in San Francisco. 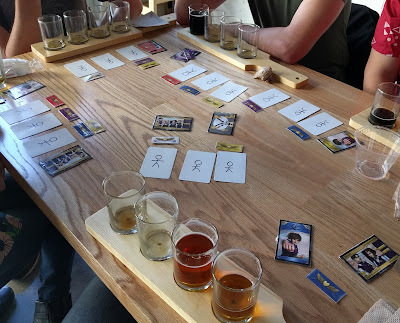 The specific beer we had was Sriracha Hot Stout. I mainly chose it because I love Sriracha, and I thought this had the coolest bottle I've ever seen, as it looks just like the hot sauce bottle (red label with green top). The beer itself was okay, a 5.7% chocolate stout with peppers that has a 79/100 on RateBeer. I do find spicy beers interesting, and this one was decent. However, the main claim to fame is the design of the bottle, which is proudly sitting on my beer shelf. Until next time my friends!